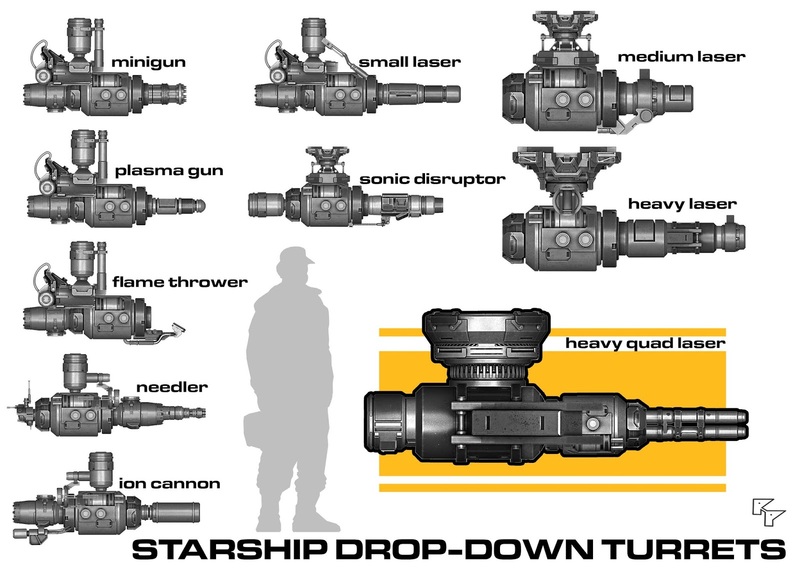 Some of my ship designs include drop-down (or pop-out) turrets. Smaller than the ship's main turret, but heavier than a man-portable weapon, these turrets are intended for anti-personnel and anti-vehicle use while on the ground or at low altitudes. These weapons are usually fired from the bridge and/or the gunner's station, or can be linked to an automated Watchdog program. These images were created using the Brainstorm thumbnail software, and are direct exports without any Photoshop work. In addition to weapons, I've been playing with the software to create starship massing ideas, and with less success, some robot designs. Anyone interested in doing sci-fi concept art should check out these videos for more info. The software is currently only $10.00 and is very easy and fun to use (if you are into this sort of thing). It works on both PCs and Macs. You can buy the software <here>. Sorry, but I argued for the inclusion of just systems in T5 and happy to say they are covered by FirmPoints. Nice to know someone else was thinking of and using them too. For me it was real navy ships which have secondaries and the like for AA and Anti-Boat work. Dude your blog is rocking, excellent work. Looking forward to more and makes me wonder if I shouldn't start doing more on my blog. Gak.